As Paula mentioned in her Betting on the CSK blog this week, the industry is abuzz this week wondering who will take home the coveted prize this year – the Coretta Scott King Award. Keeping that in mind, I added an additional caveat to come up with my predictions for who will win the 2008 CSK. My predicted winners cannot have won the award before. I want to give other authors a chance to stand in the winners circle. So I looked over the list of past winners which includes Sharon Draper, Toni Morrison, Sheila P. Moses, Angela Johnson, Nikki Grimes, and Brenda Woods. 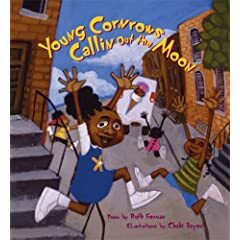 Side note to Don from his CSK Illustration Award Predictions blog this week where he pondered about the absence of Black female illustrators, I am wondering where are the Black male authors. To be fair, Julius Lester, Christopher Paul Curtis, and Walter Dean Myers have all been CSK winners in the past, but the winners have been overwhelmingly female authors. Not that I’m complaining. 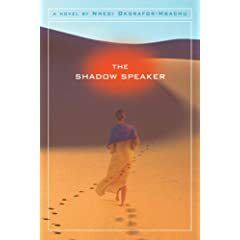 A finalist for the Essence Magazine Literary Awards as well as the NAACP Image Awards, The Shadow Speaker is classified as science fiction and fantasy which I admit I don’t read much of, but the reviews for her book are all favorable. The author takes the science fiction realm a step further by blending it with African culture. It’s time we show our kids that they too can be a part of science fiction stories. My sentiments echo Paula in that her book is receiving many accolades since publication. Touching Snow was a 2007 National Book Award Finalist, Young People’s Literature as well chosen by NPR as a Novel You Wish a Teacher Would Assign. Past CSK winner Sharon Draper stated, “M. Sindy Felin is a writer whose words flow like mercury – volatile and dangerous. She is a wonderful, mesmerizing new talent.” Essex Public Library in Essex, CT lists Touching Snow as a recommended read. Because the story is about a Haitian immigrant living in America, it adds an additional level of diversity and reminds me of Paule Marshall’s Brown Girl, Brownstones (1959) which was the story of Barbadian immigrants living in New York City. 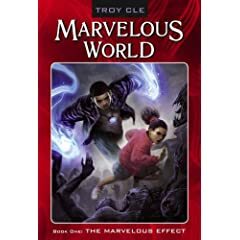 Troy Cle’s The Marvelous Effect which is the first novel in his Marvelous World series. He is a 2008 Essence Literary Award Finalist and was featured interviewed by Tavis Smiley on PBS where they discussed how Marvelous World the series is being compared to Harry Potter. The series features Louis Proof in East Orange, New Jersey who has a strong relationship with his mother as he encounters various adventures akin to what one encounters in video games. He created his series out of a desire to give us a chance to see ourselves in adventure stories like The Goonies and Harry Potter. We’re familiar with the story of Marian Anderson being denied by the Daughters of the American Revolution to sing at Constitution Hall, but Hopkinson’s words combined with Jenkins’ illustrations tell the story of Oscar Chapman who was influential in Anderson singing on the steps of the Lincoln Memorial. 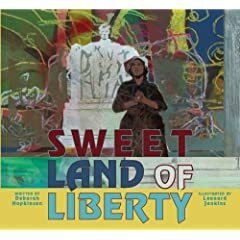 A colorful cover featuring Anderson and Lincoln as the prominent aspects, Jenkins’ use of color and swirls give the cover the appearance of artwork that can hang in a gallery or on my living room walls. The title alone intrigues me because of the idea of Harriet Tubman meeting Sojourner Truth and the two of them engaging in dialogue. I wonder what they would have talked about. Both are well known icons from slavery and in my mind represent strength so I think this book will be an asset to any library. The colors have a subtle vibrancy to them so as not to overpower Evans’ artwork. I’m not a art critique but I like Shane’s work and look forward to seeing more of his work in the future. Again, this is a fun title with an active book cover that catches your eye. The cover is filled with vibrant colors and I look beyond the primary characters in the foreground to also check out the action in the background. I call it layered artwork if you will. My personal reflection: A lot of good books are written and honored with the Coretta Scott King Award, now it’s time for many of them to become movies or television shows. Spike Lee, where are you? This was fun coming up with my predictions. Me thinketh that The Brown Bookshelf needs to have its own awards too. ::clap, clap, clap:: Carla, great predictions. I really like your selections and the rationale behind them are sound. To have any of these books win would be such a coupe. It would really mix things up and open up a new avenue for the Coretta Scott King Awards. Bring on the winners, ALA!! Ok, now I am seriously anticipating the winners on Monday. It would be so refreshing if some new people were honored, but I’m not feeling hopeful. Not entirely the fault of the CSK committee, I mean there has to be more AA talent step to the stage so there’d be a larger pool to choose from. I don’t have an exact number, but with illustrators, there’s probably no more than 10, maybe 20 (and that’s really, really stretching it) to choose from in one year. Am I wrong? Having spent the week researching authors for CSK as well as 28 Days Later, I am excited to see what Monday brings. There is such a wide range of unlauded talent in our ranks with books and authors that are flying under our radar. Even if our predictions are off, I hope that our predictions reach ALA’s eyes and ears for next year’s CSK. Paula, it’s easy to gamble with no money, LOL! Don, I agree that there aren’t “that many” in the candidate pool. But the fact remains that there are plenty more beyond the usual winners (with respect). I believe that publishers must submit to be considered for CSK, but I’m not clear if the committee already has books in mind before they receive them. I’m sure the process has something to do with why the same winners are often chosen. Another thought – if it’s based on submissions, some publishers/authors may simply not want to throw their hat in the ring if their book does not fit the usual profile. And I say that’s a mistake. Submit and let the chips fall where they may. Make the committee aware of the variety and soon they’re selections will reflect that.